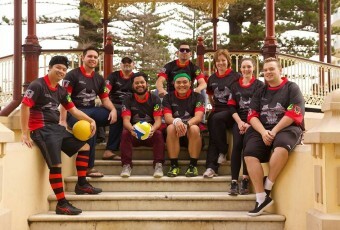 The Adelaide Augureys are South Australia’s first QAI certified Quidditch team. The Augureys first taste of competition came at QUAFL 2015 and also competed in the tournament in 2016 and 2017. With the last 2 years bringing success with wins against competitive interstate teams. The Augureys have have also experienced wins in South Australia, being undefeated against all SA teams in local competition. The Adelaide Augureys are a community team that includes members of all ages and abilities. It is comprised of experienced local members, some that have even played and refereed in Europe, as well those new to the sport of Quidditch. All newcomers are welcome and we encourage them to give it a go. The Augureys culture is about fun and fitness foremost with our spirit strong on and off the field.